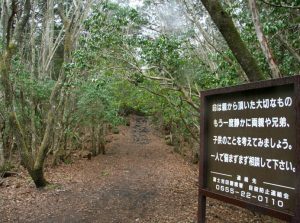 Also known as the “Suicide Forest,” “Sea of Trees,” or “Demon Forest,” Aokiagahara is one of the most dreadful places known to mankind. 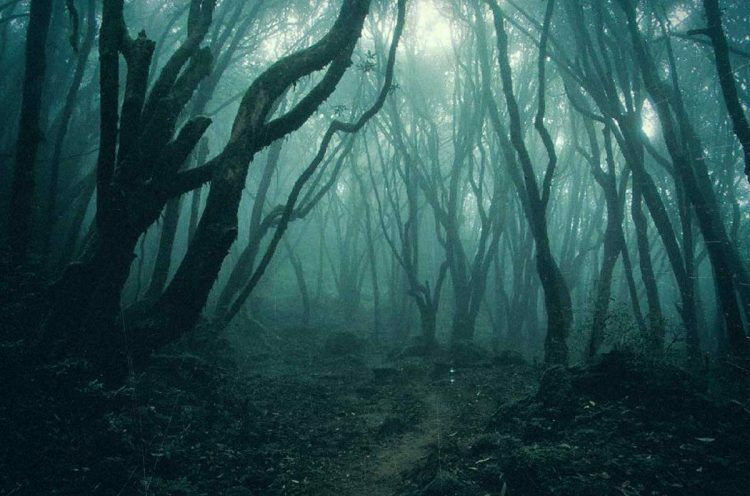 With oddly shaped trees, non-existent wildlife, and dark caves, Aokiagahara is an eerie place that bears a terrifying curse – it’s the place where people in Japan go to commit suicide. These people live their last moments on Earth without any hope, surrounded by a grim landscape that emanates evil from its every pore. But how did it come to this? It is believed that in ancient times, during famine, families living in the villages near the forest would make a horrible sacrifice. They would simply abandon family members inside the woods, condemning them to starvation and a slow death. This was done so that they could feed the remaining family members and also as some sort of sacrifice, designed to appease the spirits of the forest and end the famine. 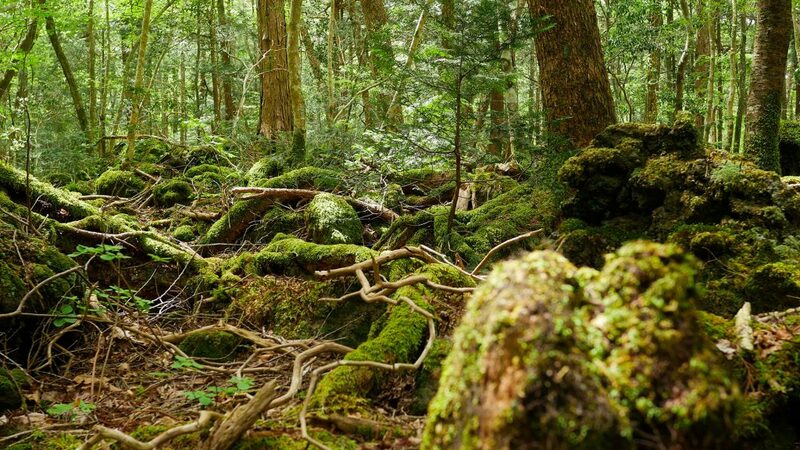 We don’t know exactly how many people died of hunger in this forest, betrayed and abandoned by their own families, but the Japanese people believe this is how it all started. According to the Japanese culture, when somebody dies heartbroken, feeling anger and disgust at this world, their spirit cannot rest. Instead, they curse this world and transform into Yurei – a sort of spirit demon that can only rest after it accomplishes its last desire before dying. 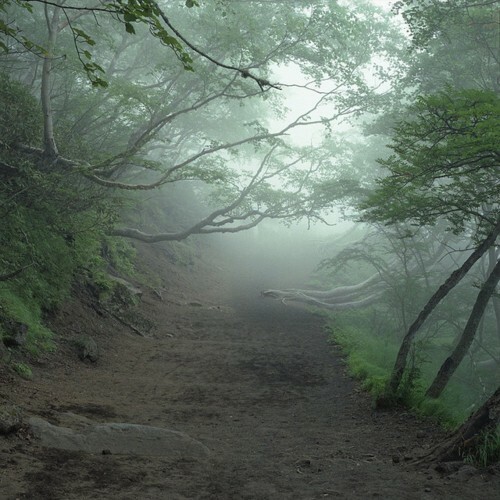 Locals think that the souls of the people who had been abandoned in this forest still haunt it, as Yurei, and try to get revenge on the ones that turned their back on them. 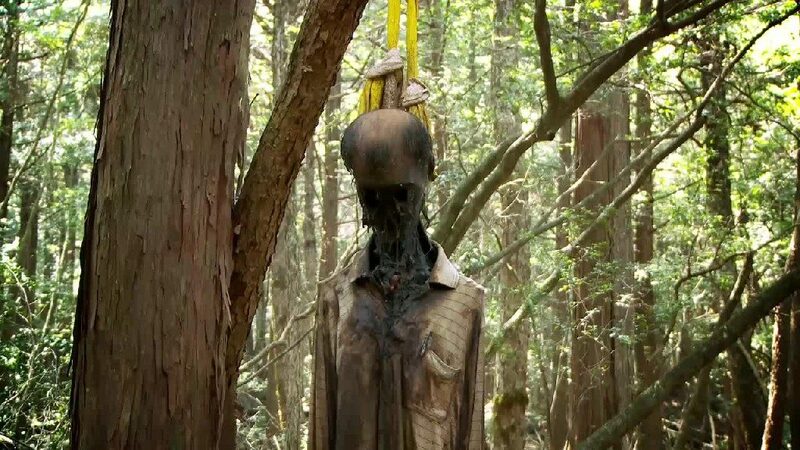 A Buddhist monk named Kyomyo Fukui explained to the journalists that the spirits of the people who had been abandoned in the forest, as well as those of the people who had committed suicide there, are the ones calling to the living and drawing them in to make them kill themselves. When you go wandering through a forest, you expect to find peace – to hear the birds chirping merrily in the trees, take in the exquisite views and fill up your energy bar. But when it comes to Aokiagahara, everything is wrong. There are no birds in the trees – everything is eerily calm as if life itself avoids this place. The trees are not beautiful – there are twisted and wrong, with roots coming out of the ground as if they were trying to grow legs and run far away from this cursed place. There are dozens of cold caves and some of them can be really dangerous. If you don’t watch your step, you can always fall into one of these dark pits. But the most dangerous thing about Aokiagahara is that you can easily get lost inside it because cells phones and GPS devices simply don’t work there. And, as if all this weren’t enough, there is always the chance of finding a decomposing body hanging from a tree. 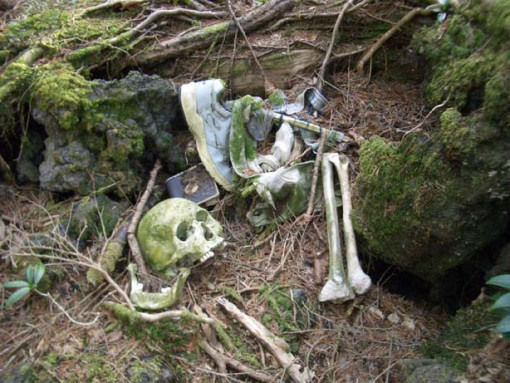 At least 500 people have committed suicide in this forest in the past five decades, but it is believed that the number is much higher. The Japanese government has started to keep the numbers from the public so that other people wouldn’t get inspired by the happenings at Aokiagahara. They have also started to place signs, trying to convince people not to kill themselves. You can see many signs at the entrance, appealing to people and telling them how valuable life is. The police and forest workers have the responsibility to sweep through the woods in search of bodies. They constantly do this because, even though the government is trying to prevent people from committing suicide, Aokiagahara is still the place where they go when all hope is lost. If you talk to any forest worker, they will have bloodcurdling stories to tell. They believe that the spirits of those who kill themselves in the forest turn into Yurei. This is why when they find a new body, they place it in a special room and one of them has to sleep the whole night with it. They believe that by doing so, they prevent the Yurei from haunting at night, wailing and screaming. Of course, since nobody wants to be the one sleeping with the body, they play a game, and the one who loses has to do this horrifying task. There were many strange happenings in this forest over the years. One woman swore that somebody had cut off her cut tape that she used to avoid getting lost and a writer from the Japan Times also reported a sickening experience. He was inside the forest when he heard a terrible scream coming from the trees. He ran towards the sound to investigate, but when he arrived here, he saw a dreadful scene. There was a body at the base of a tree, but it was decomposing. 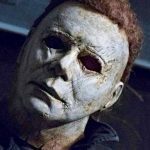 It looked as if it had been there for a while, so what the writer heard couldn’t have been the man’s last scream, at least not his alive scream. The most terrifying story is the one of a couple who went there to see the forest. As they went deep inside it, they lost reception, and their GPS stopped working. The wandered through the forest growing more and more concerned about the fact that they were lost until they saw a decaying corpse between the trees. They started running in horror, panicking because it was getting dark. At some point, they stopped only to see a silhouette emerge from the trees. It was a Buddhist monk who asked them if they had come to the forest to die. Terror-stricken by the apparition, they told the monk that they had just wanted to see the forest and had gotten lost. The monk showed them the way out of the woods but, when they finally escaped it, they found people waiting for them at the entrance. As they told what had happened to them and how the monk had helped, the people looked dumbfounded. There weren’t supposed to be any monks inside the forest at that time, and the locals were convinced that the couple had actually had an encounter with a Yurei. Whether it was, indeed, an encounter with an entity from another world, we cannot now. But what we do know is that Aokiagahara is a cursed place, one that should only be visited if you have a healthy heart and are prepared to face the horror that lies inside.